Eggs are a real wonder food: they form the basis of hundreds of recipes they can be prepared in so many different ways and they can be eaten for any meal of the day. There should always be a carton of eggs in your fridge and there's no excuse for letting them fester there until after their 'use by' date. If your budget allows, choose free-range organic eggs. You'll find the taste is superior to eggs produced by battery hens, and your conscience can rest a little easier. Boiling an egg is often cited as being one of the most basic cookery techniques and the first thing that any novice should master. However, for every person who enjoys a boiled egg for breakfast, they'll have a different way to prepare it. A lot of this comes down to personal preference: some people like a really runny yolk while others prefer it to be set. The important thing is to make sure your eggs are cooked through properly: if you're not sure then discard it and start again - better to be safe than sorry. Here, we take you through the basic cooking techniques. Place the egg in a small pan, cover generously with cold water and add a dash of vinegar (this helps to stop the egg splitting). Bring the water to the boil then let it simmer for 3-4 minutes (depending on how well done your like your egg). Remove the egg and crack the top quickly. Accompany with toast 'soldiers' for the ultimate boiled egg experience. Not the healthiest option but hard to beat for a weekend breakfast. Heat a little vegetable oil in a small pan (large if you're adding other ingredients). Carefully crack the egg into a mug then pour it into the centre of the pan. Use a spatula to keep the edges together until they begin to set. Fry until the egg is cooked through then flip briefly, if you like your eggs 'over easy'. Serve on toast or a muffin. You can also 'fry' eggs in the microwave. Melt a little butter on a microwavable saucer or small plate. Crack the egg onto the saucer and pierce the yolk with a fork (so it doesn't explode). Cook until set (this will depend on your microwave) but check after 30 seconds. Bring a pan of water to the boil. 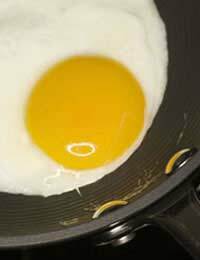 Break the egg into a large serving spoon or ladle then carefully place it in the pan. Use a slotted spoon to keep the egg together until it has set. Simmer until the egg is cooked through then remove with the slotted spoon. Crack two eggs into a small bowl. Season with salt and pepper and add a little milk. Whisk well. Heat a little oil or butter in a pan, over a low heat, then pour in the eggs. Use a whisk or wooden spoon to stir the eggs constantly as they cook. Again, cook to your liking. The eggs should be springy but not rubbery. Beat the eggs with a little milk in a bowl and heat the pan. You should move the eggs around the pan, but not stir, until they begin to set then just keep lifting the edges a little so the omelette doesn't stick. Just before the eggs set, sprinkle some grated cheese on top and fold the omelette in half. You're aiming for the bottom of the omelette to be just browning, while the cheese in the middle melts. Eggs are perfect for quick snacks and meals as they're filling, as well as being easy to prepare. The cooking techniques are easy to pick up and it's really just a case of adjusting them to suit your own preference.